Crucible of Tradition – A Sea of Heroes and Traitors. I have just finished reading “The Crucible of Tradition” and it was a great read. Mr. Perry’s attention to detail brings the characters to life and gives the reader a sense of being front and center. 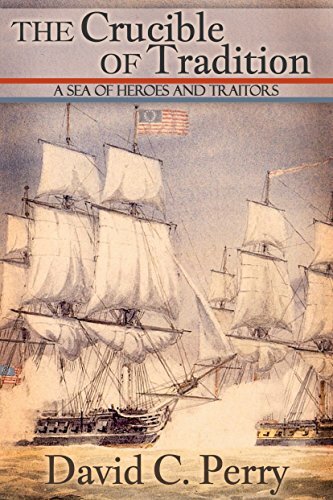 When sitting down to read this novel I feel that I have donned my best nautical attire and am sailing again with Captains John Barry, John Paul Jones, Jordi Farragut and others in this sweeping new sea saga. “The Crucible of Tradition” chronicles 30 years of colonial struggles along the Atlantic Seaboard, Caribbean Sea, and European waters. Landsmen, officers and sailors alike are all severely tested in their heroic efforts to establish a new nation and the fledgling Navy as a sea power. David Perry paints a vivid detailed picture with his pen, placing you on deck, in the rigging, and behind the cannon in explosive battles on the high seas against the British, pirates, and privateers. The reader will become part of the war for independence. Meticulously researched, this novel, the second in the series, will introduce you to the men who secured America’s independence while others framed her government. You will walk the streets of colonial America in scenes that were pulled from period maps and newspapers. Fight, grieve, and exult alongside the men and women who were the actual flesh and blood heroes of their day.